This is a part of Science Diction, a series digging into the scientific origin stories behind our words and language. Find all our stories and previous issues here. 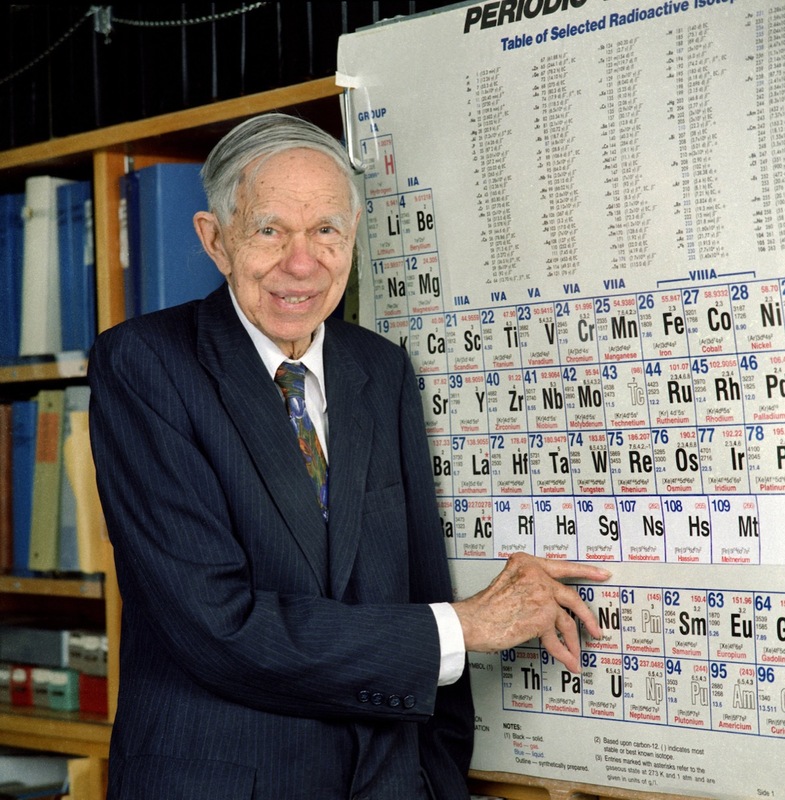 Seaborgium gets its namesake from—you guessed it—the Nobel Prize-winning chemist Glenn T. Seaborg. But both the name and the discovery of element 106 caused a major controversy. In 1993, the American team’s experiment was finally independently confirmed, and the team clinched naming rights. But no fewer than eight scientists were involved in the discovery on the team, and there were a lot of suggestions—from naming it after Isaac Newton to the nation of Finland. The suggestions flew back and forth until the physicist Albert Ghiorso awoke in the middle of the night with an idea. After getting approval from the other members of the team, Ghiorso set up a meeting with his old friend and colleague, Glenn T. Seaborg. 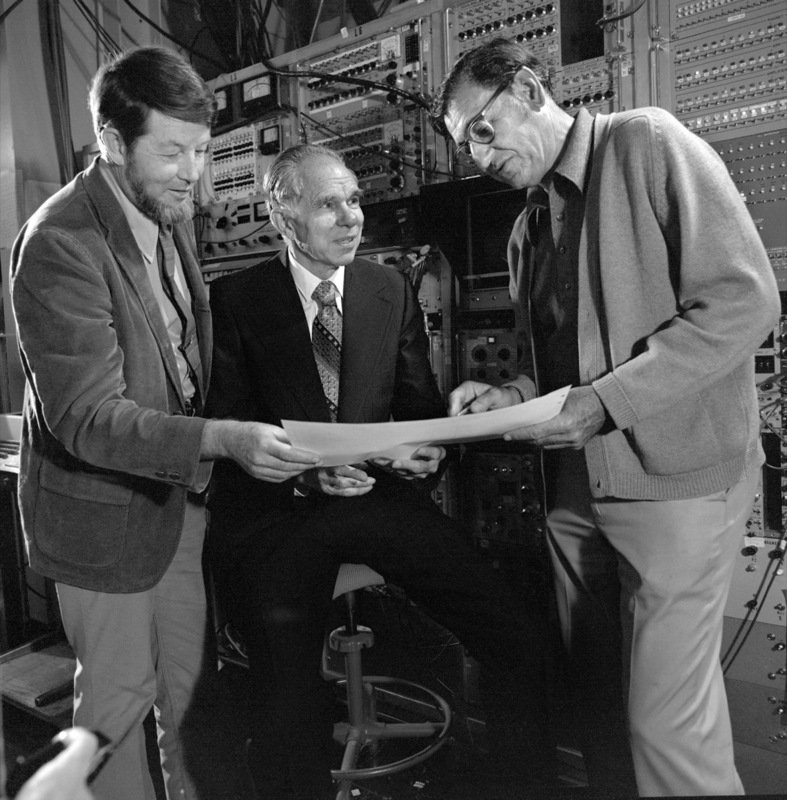 Seaborg wasn’t directly involved in the project, but was a Nobel Prize-winning physicist instrumental in the discovery of plutonium, and he was the associate director-at-large of the Berkeley team’s lab. When the meeting arrived, Ghiorso brought a folder called the “Element 106 Story,” handed it to his friend, and watched Seaborg open to the first page with the name of the proposed element. There had been rumblings since the 1950s to name heavy elements after Seaborg, to honor the role he played in the discovery of transuranian elements, or elements that fall after uranium on the periodic table. It had never amounted to more than suggestions before, but with element 106, Seaborg would be officially enshrined in the elemental hall of fame. The IUPAC shot down the proposed name. To top it all off, the seaborgium uproar found itself smack in the middle of a swirling international controversy around naming several elements. Over the course of two decades, researchers in the U.S., Germany, and Russia had created a slew of ultra-heavy elements—elements 104-109—using nuclear accelerators. And while the atoms created from these collisions diminished within seconds, the name of the element would last as long as the periodic table. And by the 1990s, the IUPAC was trying to keep everyone happy. Thus ensued a dizzying series of naming switcheroos and proposed—and botched—compromises by the IUPAC. Try to keep up. Element 104 would be renamed dubnium, in a nod to the Russian lab (yes, the same lab that co-discovered element 106). That didn’t go over so well with the Berkeley crew, as they considered the Dubna team’s results suspect, and element 104 had previously been known as rutherfordium in the U.S. Element 105, which had been proposed as hahnium (after the German chemist Otto Hahn), would be called joliotium, after the nuclear physicist Frederic Joliot-Curie. And after scrapping seaborgium, the committee suggested reassigning the booted rutherfordium to element 106. The back and forth went on for years, until a compromise was finally reached in 1997. In the end, rutherfordium was restored to element 104. Dubnium was here to stay, but ultimately assigned to element 105 instead. Neither Otto Hahn nor Frederic Joliot-Curie have gotten their day (yet). And with element 106—after heated discussion and lobbying—seaborgium became the first element named after a living scientist. Let’s say you discover an element. How do you name it? After confirmation of discovery, researchers may suggest a name to the IUPAC Inorganic Chemistry Division. Part of that process is a five-month public review period. 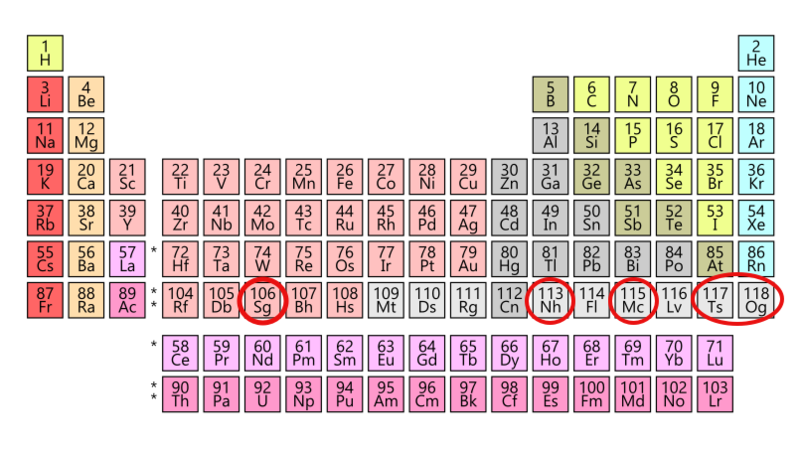 For example, in 2015, there were four elements confirmed: elements 113, 115, 117, and 118, rounding out the 7th row of the periodic table. And while the team who “discovered’ the element gets naming rights, the public are welcome to chime in, too. Although merely invited to comment on the already-proposed names, that didn’t stop many people from suggesting their own names for elements 113, 115, 117, and 118 during the public review process in 2016. Suggestions ranged from renowned chemists in the past who don’t have an element to their name (an internet petition to name one of the elements “Levi,” after chemist and Holocaust survivor Primo Levi, amassed signatures from 3,000 professional scientists and supporters), to recently deceased musicians like David Bowie, and others “(semi) jokingly” proposed names like Tattooine and Taxpayeron. In addition, the IUPAC received essays from 75 students weighing in on what name should be bestowed upon the new elements. After much discussion, in 2016 element 118 became the second-ever element to be named after a living scientist—and it just so happened to be named after Yuri T. Oganessian, who is now the scientific leader of the same Dubna lab that co-discovered seaborgium. The other three new elements also followed conventional naming standards: Moscovium (element 115) and tennessine (element 117) honor their respective regions where important research was conducted, and nihonium (element 113) is one way to say “Japan” in Japanese, and is the first element in history to be discovered in and named after an Asian country. Oganesson, moscovium, tennessine, and nihonium completed the 7th row of the periodic table. But are there any more elements to find? Probably. And Reedijk says discovering new ones is in the hands of physicists and chemists. And as for naming those future elements, Reedijk suggests keeping a database of the names proposed by the public. In the future, one just might fit. Calling all word nerds! Sign up for Science Diction, a weekly email about words, science, and language. In honor of the 150th anniversary of the periodic table, Ira opens up the Science Friday vaults to share tales of chemical discovery and creation.